WARNING: This post may contain nuts, as well as spoilers for Far Cry 2, Mass Effect, Halo 3, Chronotrigger, Metal Gear Solid 4, Final Fantasy X, Call of Duty 4, Jericho, Passage, Bioshock and Eternal Darkness. This post is part one of a two part Sensationalist series how games use death to evoke emotions. This post pertains to the permanent death of playable characters . Not only did the topic become too expansive for one post, but I forgot to post a Sensationalist article for September. Consider this series an intricate apology. Last week on the EXP Podcast, Scott and I discussed the relative absence of "downer" or tragic endings to videogames. In general, games end triumphantly with the lead character heaped in praise. But on occasion, all does not end well. As these unsettling conclusions go, death is the most disturbing plot device. Even more rare than sad or ambiguous endings, is the permanent death of the lead character. Death, the real life variety, is a complex and incredibly emotional artifact of life. Death also changes. Some lament, for example, the higher rate of in-hospital versus in-home mortality, a relatively recent occurrence. How we approach death and dying is both personal and cultural, and trends poke up and reveal themselves in popular media. So, when a videogame makes an evocative move by killing off a playable character, we should pay attention. I want to be clear that when I refer to death in this post, I mean permanent narrative death, not the mechanic by which players are punished - though this, too, is incredibly interesting. Of course the two elements are intertwined, but permanent death is a story driven decision meant to evoke more emotions than temporary game-overs. "The main character is an extension of ourselves, a sort of prosthetic limb reaching into the game world. If he 'dies' before the end of the game, it's irritating, frustrating perhaps, but we know in our hearts that this was not the way things were Supposed to Be." The suggested trap of lead character death lies in this dilemma. The moment the playable character dies, she is no longer an extension of the player, but a person to mourn. Yet we do mourn these characters differently. There is some remnant of ourselves in these characters, with which we empathize, that makes their death resonate with us emotionally. There are numerous games that exploit these sensations by faking the lead's death. Chronotrigger's titular hero dies at one point, only to make a triumphant return. 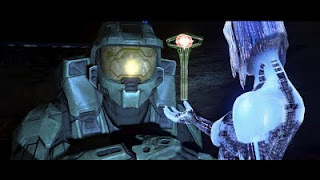 Master Chief in Halo 3 is presumed dead until the post-credits cut scene; and an award for style goes to Commander Shepard of Mass Effect who rises from the ashes after a harrowing final battle. These scenes heighten the sensation of success, as the player beats death itself. While not permanent, the moment when the player and NPCs think the lead deceased is interesting. More often than not, this character is publicly mourned. Even Left 4 Dead, a game with respawns, will have the end credits read "In memory of" for those players who do not escape. With rare exception, player-character death is time for others to praise the player's efforts. As if to avoid the tragedy of mortality, a culturally western trend pervasive in entertainment media, games largely present noble deaths. These characters often make the ultimate sacrifice alone, knowingly separating themselves from the NPC cast during the final battle. The exceptions to the noble and solitary death are fascinating. Tidus, at the end of Final Fantasy X, leaps into non-existence. But, unlike most dead leads, is fully aware of his fate and is given a brief moment to say goodbye. His death manifests itself during this scene, as his gradual disappearance takes place. Tragically Tidus cannot be with the one he loves, but when he plummets he sees the smiling faces of others who have died before him, and even gives a low-five to his father. Like the noble sacrifice, Final Fantasy X redefines the success-failure dichotomy of most videogames. For Tidus, there is nobility and even happiness in death. Though set apart in a cut scene, his death evokes the mixed emotions of losing someone. There are a few other notable and moving exceptions. Passage, a meditative game on mortality, presents solitary death. The player's avatar dies after his companion dies. Both die naturally and without a hero's praise. The first death is tragic, and now alone, the death of the player-character is welcomed. By evoking a sense of loss, the player-character's death evokes a sense of comfort as well as sadness, a set of mixed emotions accompanying real life death more than heroism. Bioshock takes a similarly brave approach to death by not killing off Jack prematurely at all. In the final scene of the "good" ending, Jack dies of old age, surrounded by the Little Sisters he raised. Tenenbaum narrates: "In the end, what was your reward? You never said. But I think I know. A family." Unlike the noble deaths of classic heroes, Jack's death is informed not by his in-game heroics, but by the life he led afterwords and the life he gave to the children he saved. Success is slightly redefined, and his death evokes a calm happiness that comes with the end of a life well lived. Another powerful lead character death, which both Scott and I have written about before, occurs in Call of Duty 4. A nuclear bomb explodes, devastating an entire city and taking down the player-character's helicopter. The lead, Sgt. Jackson, crawls out from the wreckage to gaze upon terrible destruction. Jackson's death is not a noble, sudden, and solitary sacrifice. His death is ugly, painful, and he is one of many. In Scott's words: "Regardless of the particulars of his or the player's story, Jackson is distilled into three sterile letters: 'KIA.'" Sgt. Jackson's death tops my list of evocative PC deaths because, like Passage, the act of dying is playable. With limited mechanics, the player maneuvers Jackson out of the helicopter herself. 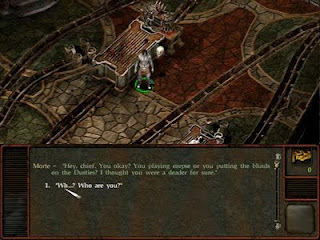 To return to Adams's metaphor, the player can feel the extension of herself in the game world weaken. By contrasting high control to low control, Call of Duty 4 evokes a sense of shock, desperation, and loss. Far Cry 2 succeeds in a similar way, giving its lead a noble sacrifice without glorifying her role in the conflict or her life. Both final missions are suicidal in nature, and are willingly accepted as a form of penance. As an opposite to Bioshock and the heroics of others, the lead is only noble in death. The player, culpable along with her avatar, dies justly. Death in Far Cry 2 evokes a sense of completion and atonement, not success. There are other examples I do not have time to cover here. Jericho and Eternal Darkness kill lead characters, creating a lingering sense of fear and paranoia for the surviving cast. Interestingly, Snake in Metal Gear Solid 4 knows he is going to die prematurely, but the game ends before his demise. Player death is also a slim possibility in The Graveyard, which is itself a contemplation on loss. Some of these I will discuss next week. In the mean time, I'm interested in hearing your opinions and experiences. While I hope I clarified some of my own thoughts, the questions I asked at the end of my post on mortality from awhile ago still stand. How does death in videogames reflect cultural perceptions on the subject? Does the mortality or immortality of a character affect how we approach a game? Does character death still serve its purpose if we have grown so accustomed to it? I'm dying to find out. That is to say that age-old cultural understandings (which seem to be spiritual in nature) of death are still propagated in mainstream art. The hero's (or 'player's' death if I am to accept the suggestion that the hero is the limb of the player) death is never the same to us as a henchman's death. Although it pains me deeply to bring up a hackneyed example - our response to Cloud dying in FF7 would be inherently different than Aeris's death. Why? I don't think it's only because Cloud is the protagonist. It is because Cloud is the *hero* of the story, and the salvation of the world depends upon his survival. If anything, permanent hero death, or martyrdom is an interesting concept in games, mostly because it is so rare. The great majority of games stay closer to the Campbellian trope of near-death, or apparent death, and eventual resurrection. When I was younger, I remember playing my main Wasteland character (the leader of the crew), "Detryk", for two years. *TWO YEARS* I spent cutting his teeth in Needles, Vegas and the wastes. He was just short of a militaristic deity, or so I thought. And in one fell swoop, he was injudiciously cut to ribbons by something that looked like a SCUD launcher on avatan. My medic was himself badly injured and incapacitated. The whole crew was sick with radiation poisoning. I raced to the nearest doctor's hut, and just as I passed through the doorway, my beloved Detryk - who exploded Jackie's dog like a blood sausage, and singlehandedly wiped out everyone in the courthouse, went from MRT to permadeath. I heard my Apple ][e disk drive whirr, and (owing to Wasteland's draconian save system) overwrote my only saved game. Detryk was dead, and the rest of the crew was badly injured, and it was as far as I was concerned, the end of Wasteland for me. Now - Detryk dying was not a nearly-arranged narrative death that followed the plot arc determined by the designers. It also wasn't the kind of death that acts as "punishment" for poor gameplay. It was a real death, the kind of death only meaningful because I (the player) expressed myself most fully in the character. Jack's death in BioShock barely touched me at all, because he (as a character) was not investable... I was never drawn in by his particular plight, nor the world he lived in. I was terrified by his world... it was a scary place, full of tension. But it was not one I could assume for myself and dwell in, and because of that, Jack's death in the "nice" ending felt simply like reading the last page of a textbook... narrative closure. Sorry for the ranty reply - the topic was fascinating and I wanted to get in something before I hit the hay! The classic first death in Hitchcock's Psycho with the effect of cutting the audience adrift without a point of identification in the film is something that could inform game design. It shows how the audience experience can be fundamentally changed when their main source of interaction and investment in the narrative of the film is suddenly gone. Being shunted onto previously minor characters provided a new and unnerving experience for viewers. I think death in videogames could follow this model as it is a medium suited to providing specific frameworks for a players interaction with the world, and such frameworks could be altered if their character was suddenly taken from them. Did the experience that followed Jackson's death give you 'permission' to feel the way you did in any way? Epic comment Chris. I'm not familiar with Jung in thoroughness, but the hero archetype is spot on for those heroes who narrowly miss a noble death. Which is partly why Jack's death in Bioshock was interesting, because his death was, as I saw it, disconnected from his in-game heroism. This isn't to say ANY of my examples are as powerful as they could be. The fact main-character death is so rare in the first place is proof enough that there is a lot more narrative to explore. Your Wasteland example is a good one too. I was tempted to mention the perma-death scenario from Ben Abraham, but it has already been discussed by others. My issue with the personalized version of death, particularly with games not designed with this possibility in mind, is that NPCs may not react to this death in a realistic way. I wonder what sensations would have arisen had others mourned your characters loss in addition to yourself. Mourning and NPC death I'll talk about next week. I absolutely love you mentioned Psycho (I'm a huge Hitchcock fan). I agree that a similar strategy can effectively jar players. In which case, it would be less resonant in games that already let the player control multiple characters. So while the CoD4 death was jarring, I wouldn't attribute it to a new experience. Now if Sgt. Jackson had been more fleshed out, and had I not been as familiar with another nameless marine, then the result would have been different. And if the mechanics changed with a characters passing? How neat would that be? @Jorge - Oooh.. NPCs who mourn another's (or the PC's) death? Now that is damned fine character development. I think that's what makes FF7 emotionally believable for me, among other games. I'm curious if 'Heavy Rain' will take advantage of mourning? I definitely think that death has a place in great narrative. I also happen to think that most games wouldn't know great narrative if it bit them in the squishy bits. It's unfortunate, really. Games can do a lot to make death poignant or meaningful, considering the power of the interactivity of the genre.